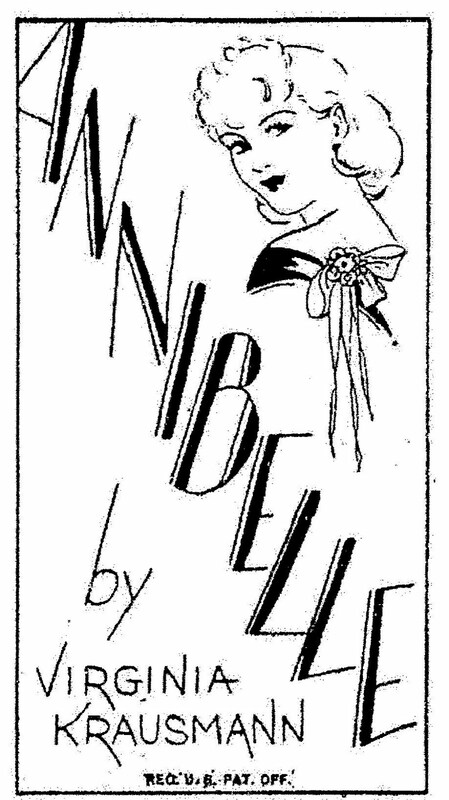 ANNIBELLE'S New Dance Frock, from November 22, 1936. 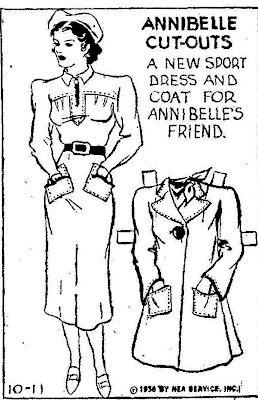 A New Sport Dress and Coat For ANNIBELLE'S Friend, from October 11, 1936. Intriguing ensembles like this one, which is equally smart with or without the jacket, explains why BOOTS, the popular comic-strip heroine - always look so fresh and modish. The costume is easy and fun to make at home. 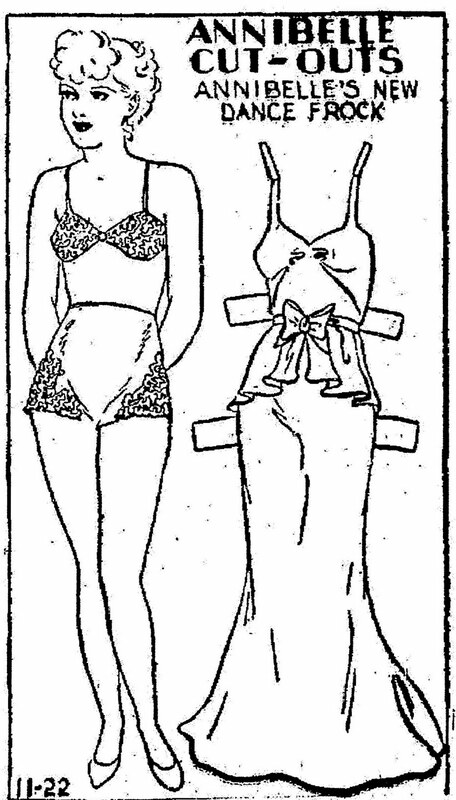 In this charming frock you can go to holiday parties looking just as youthfully chic as BOOTS, the heroine of this newspaper's popular comic strip. 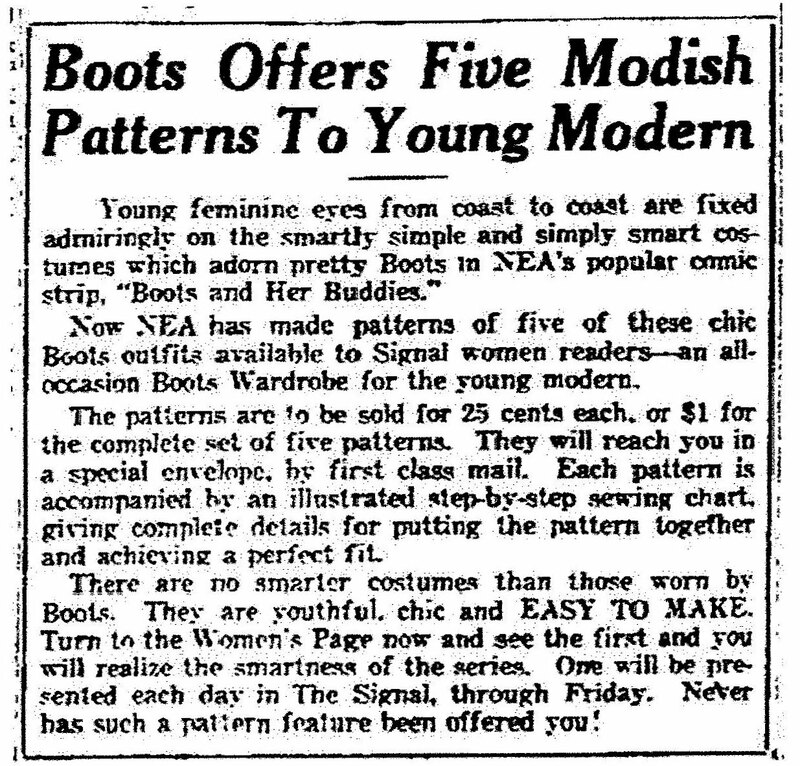 No wonder BOOTS is a style leader for the young folk of the nation! 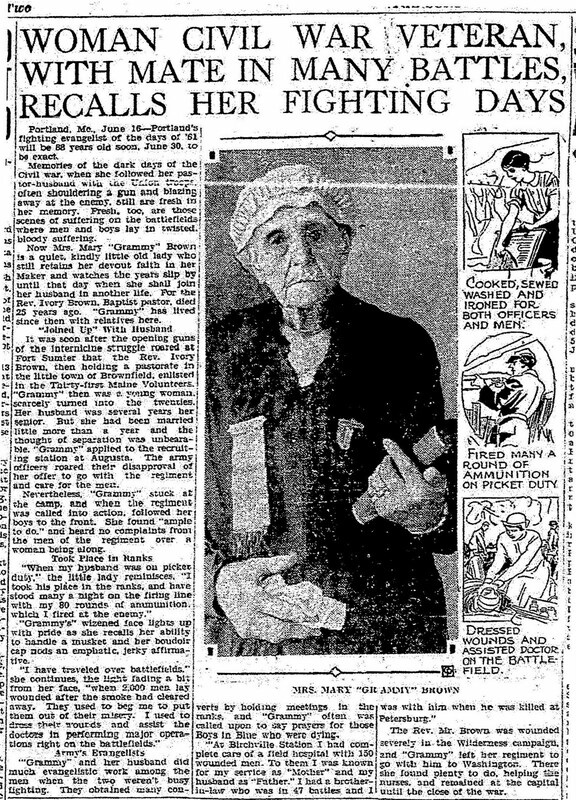 From April 11, 1936. Many thanks to Edgar Martin. A typical "Boots" costume - chic and charming in its simplicity - is the street or campus frock illustrated above. This modish number from the popular comic strip heroine's wardrobe is yours for the making! 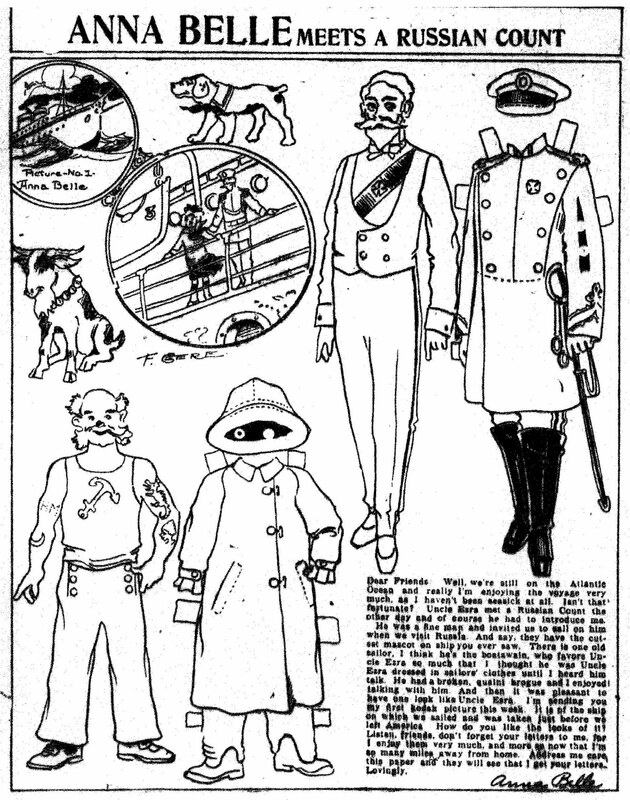 An all-purpose costume - with style to Boots! 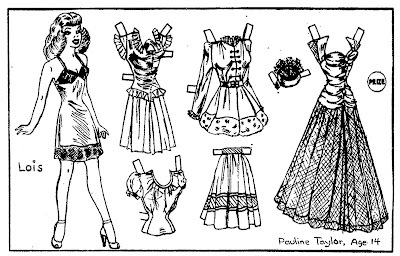 This suspender frock with the wrap around skirt and the contrasting blouse is one of the smart but useful numbers in the winter wardrobe of this popular comic strip girl. 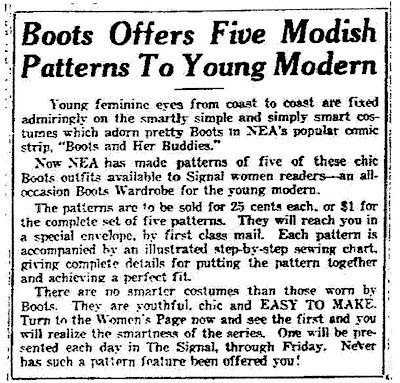 The BOOTS patterns were advertised in newspapers in October and November of 1934. History. I love history. When I came across this story I just had to copy it. 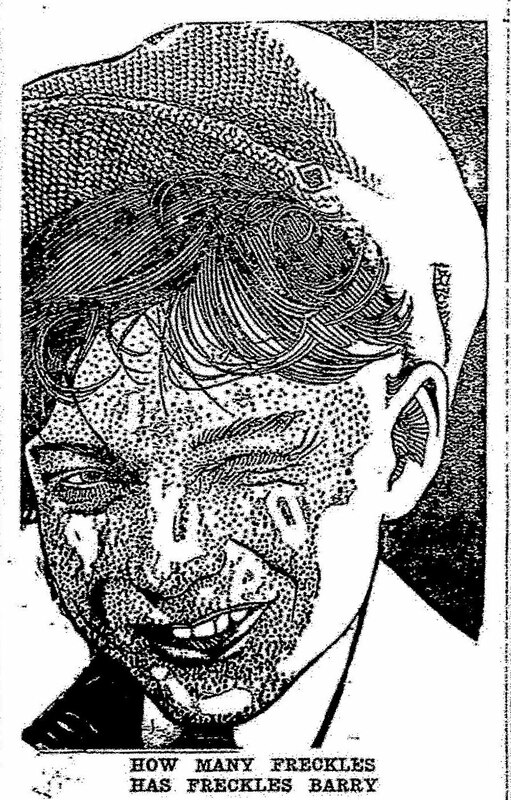 From the Zanesville Signal, June 17, 1928. 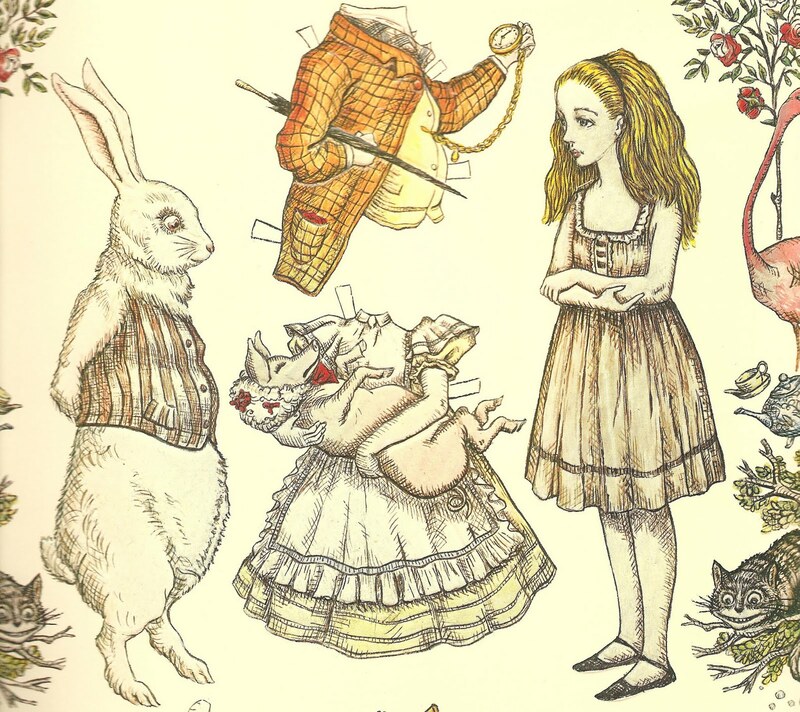 "Professor Goose has a yellow beak and yellow legs, as well as yellow buttons on his red coat with its green lapel and blue tie." 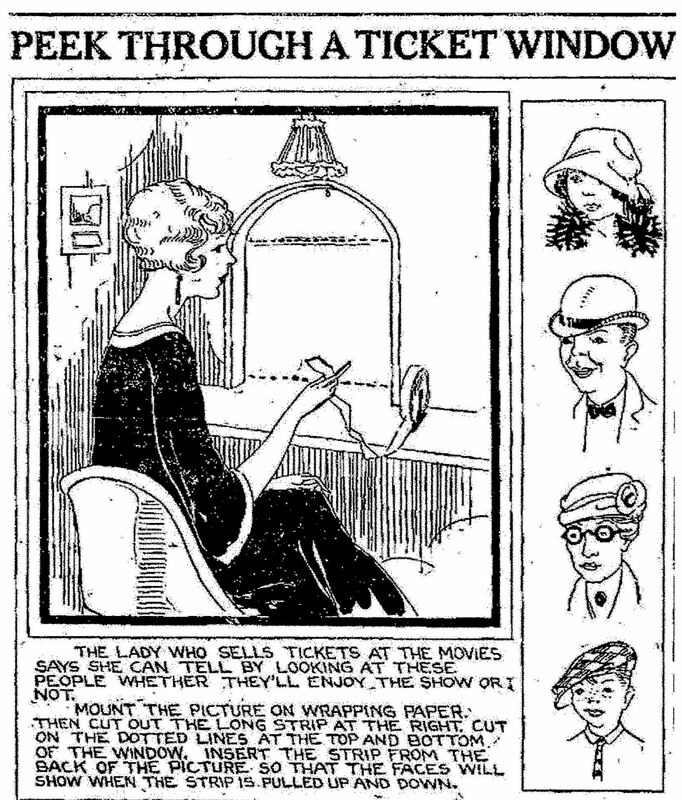 From the Betty Cut-Out series, November 05, 1923. 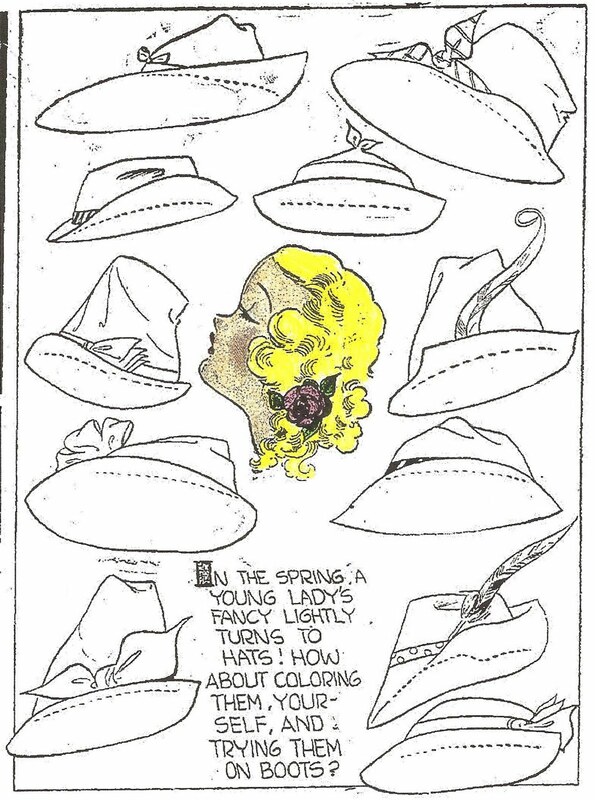 Something fun for the kiddies that appeared in newspapers in June of 1924. "The lady who sells tickets at the movies says she can tell by looking at these people whether they'll enjoy the show or not." "Mount the picture on wrapping paper then cut out the long strip at the right. Cut on the dotted lines at the top and bottom of the window. 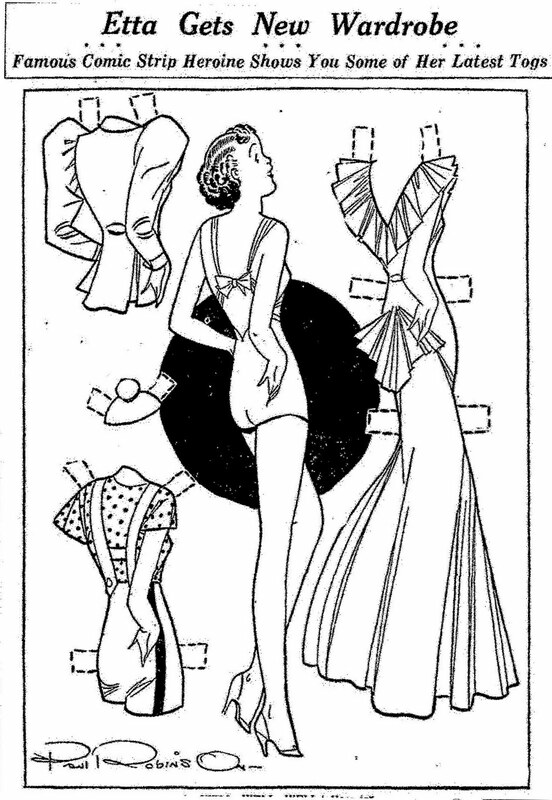 Insert the strip from the back of the picture so that the faces will show when the strip is pulled up and down." 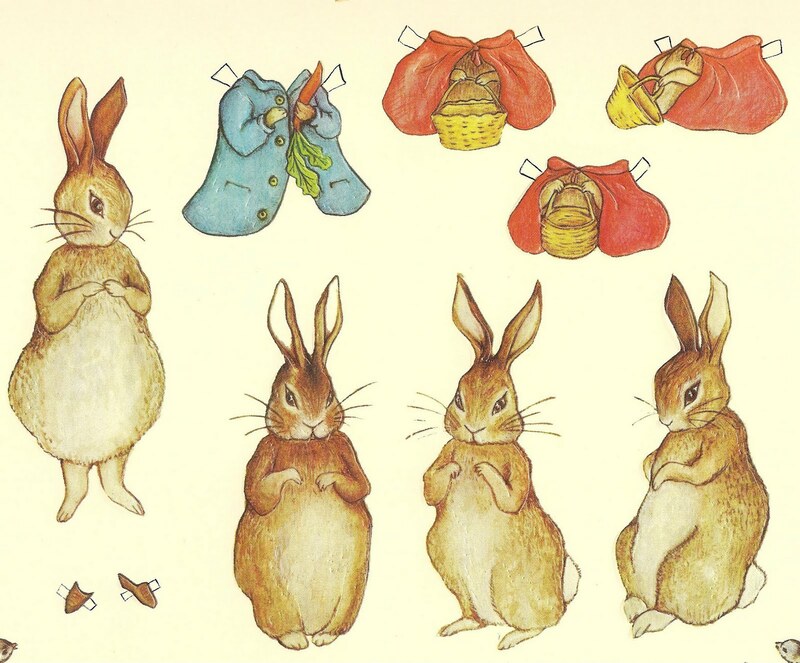 " Mrs. Grump is as proud of her blue fringed napkin cape with its red bow on the bonnet as she is of her bad disposition, or her fine pedigree or her white eggs in their brown nest." 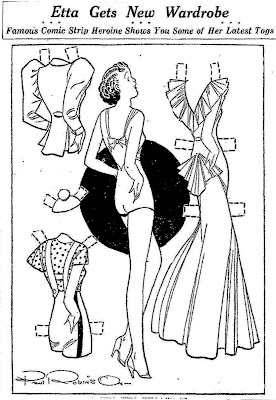 From the Betty Cut-Out series, November 06, 1923. This contest appeared in the Mansfield News on October 30, 1922. Winners received tickets to the movie "Penrod", starring Freckles Barry and based on the novel by Booth Tarkington. 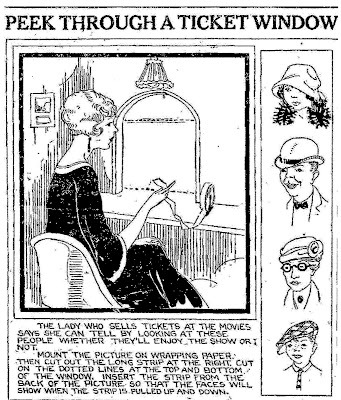 From the "Betty Cut-Out" series, November 08, 1923. - Billy Cut-Out was the explainer at the Cut-out Community Poultry show. "Now speaking of fancy birds," he announced to the group of school children he was taking around, "the Czar of Russia has won as many medals as the monarch for whom he was named. At present he is a little lame, for he was in an altercation (that means a fight) with the turkey gobbler at the end of the row. He parts his gorgeous head feathers in the middle, and he is able to crow exactly on the hour by the watch in his waistcoat pocket." * * * Coloring the czar is a test of your ability as an artist. Make his feet and beak yellow and his wattles red, leaving the shaggy comb white. His breast is bluish gray blending into black and green on the back and tail. His waistcoat is orange, his tie purple. Look for trouble tomorrow in the Cut-out show! 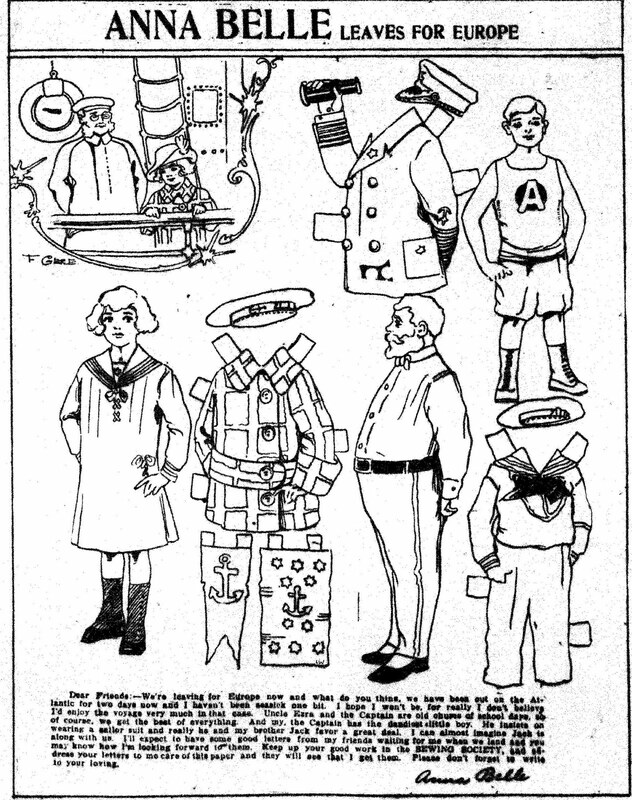 This paper doll by the talented Raye Dryer, appeared in an Indiana newspaper on February 22, 1914. 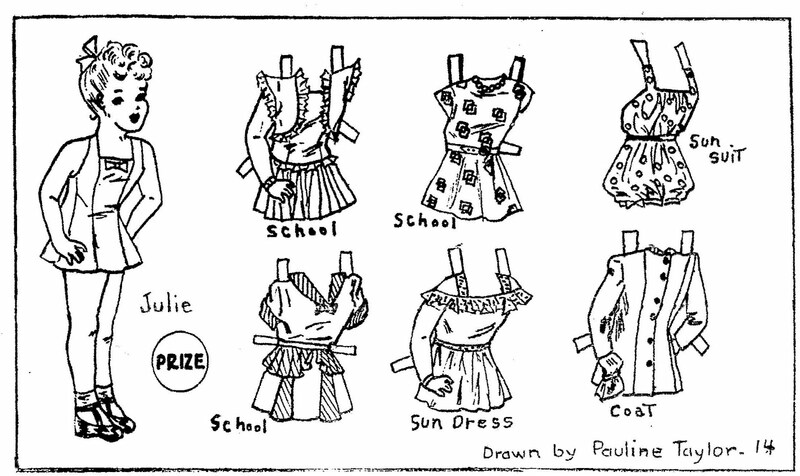 From the Jack and Jill paper doll series. 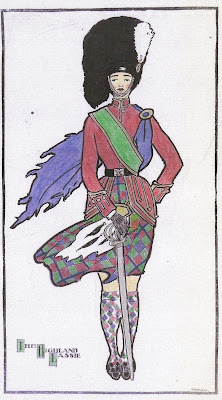 The Highland Lassie by R. Thomson, from the newspaper Poster Girl series, made its appearance on August 24, 1902. 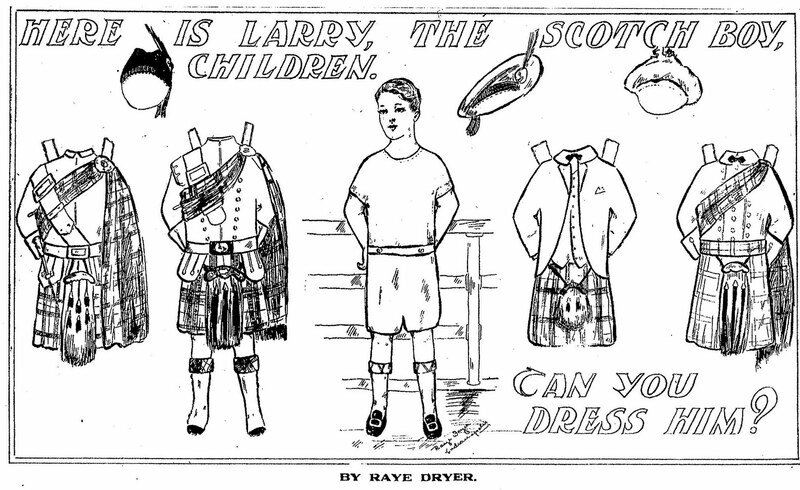 The Scotch Cottage by Patten Beard appeared in newspapers on May 01, 1910. 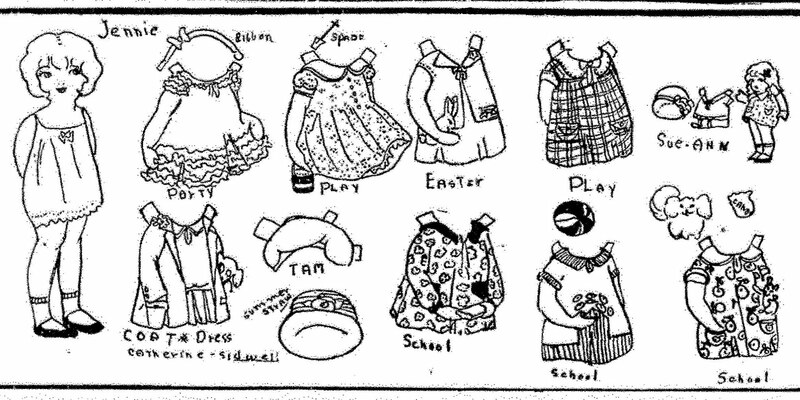 This Jennie paper doll and her wardrobe, including a dress for Easter, appeared in the Tribune on May 13, 1928. Drawn by Catherine Sidwell. 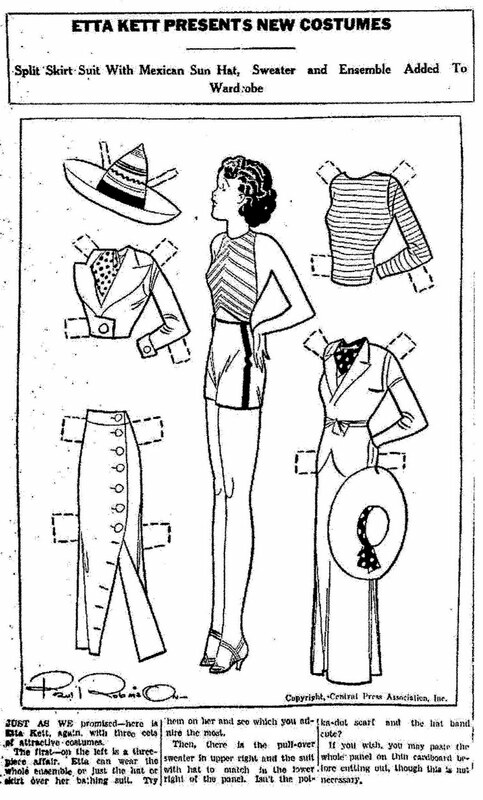 This paper doll is from the "Betty Cut-Out" series that ran in newspapers for several years. 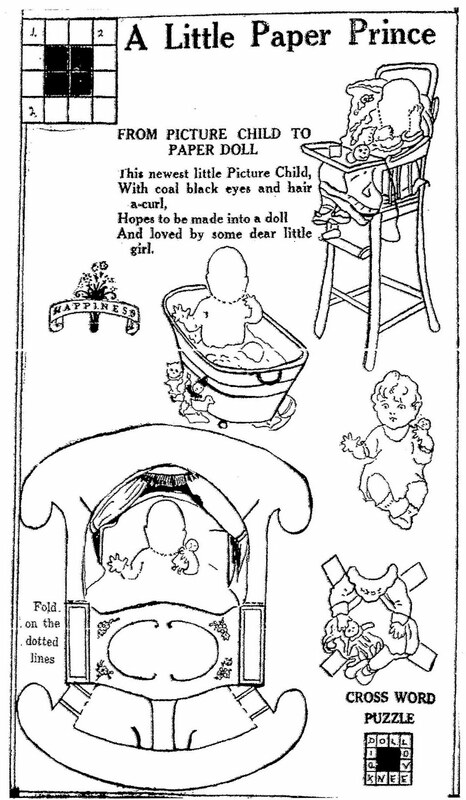 The Doll Betty Dressed appeared in newspapers on December 15, 1923. 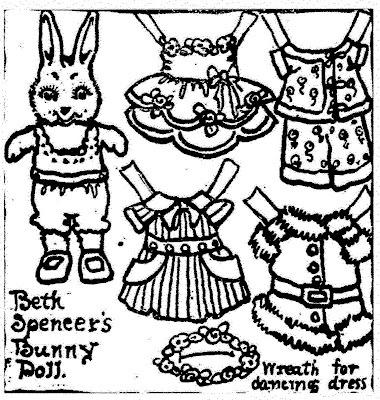 Beth Spencer's Bunny Doll appeared in the Tribune on March 21, 1920. 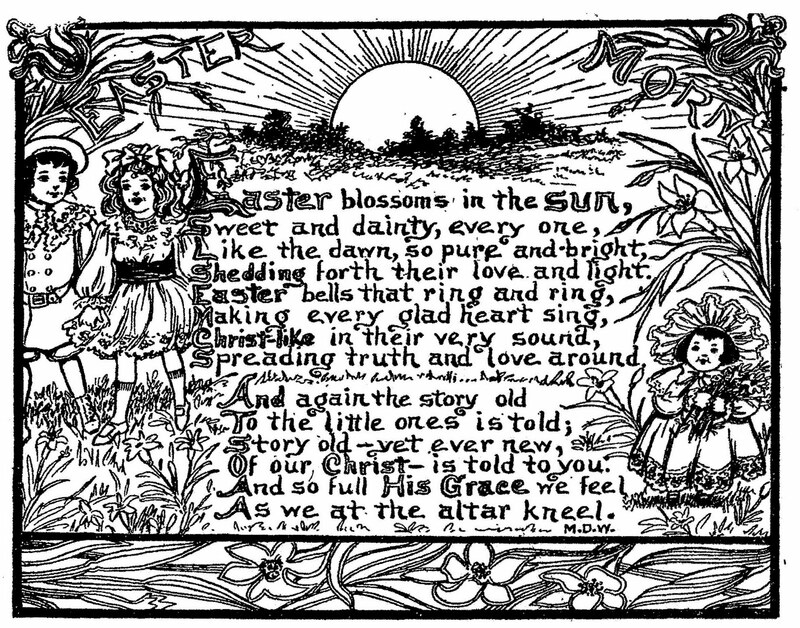 A lovely Easter poem from the Children's Page of The Washington Post, April 23, 1905. This could be made into a pretty Easter card by adding some colors. 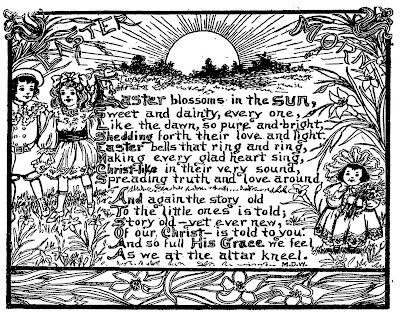 "And again the story old/ To the little ones is told;/ Story old - yet ever new,/ Of our CHRIST - is told to you./ And so full HIS Grace we feel,/ As we at the altar kneel." "Split Skirt Suit With Mexican Sun Hat, Sweater and Ensemble Added To Wardrobe." 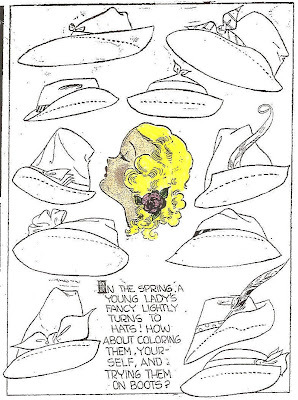 This Etta Kett paper doll is from February 1936. AN EASTER BUNNY AND A BASKET OF EGGS. 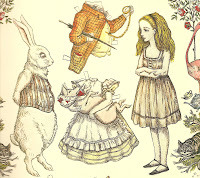 "To be made by bright boys and girls. 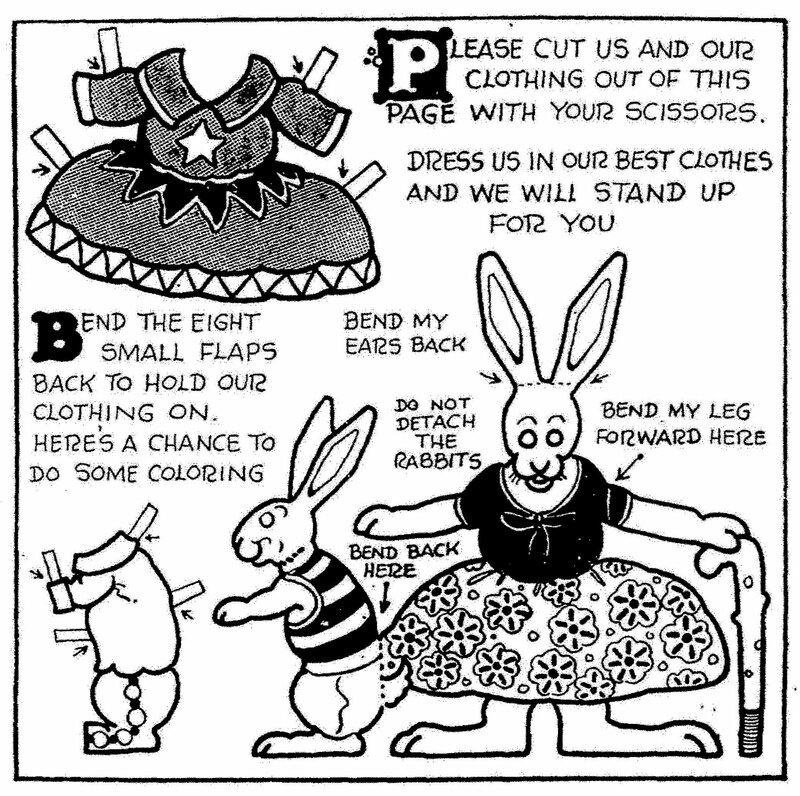 How to make the jointed bunny. 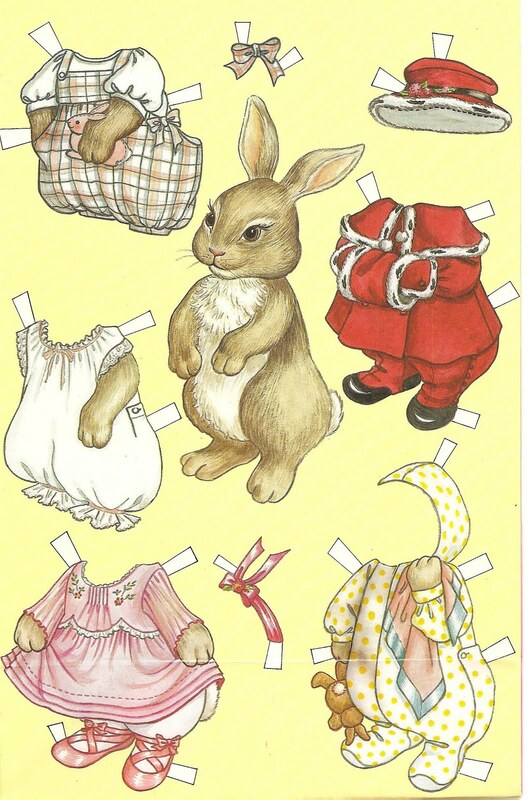 Fasten Easter Bunny's arms in place with small, double-pronged paper fasteners or with tiny collar buttons." 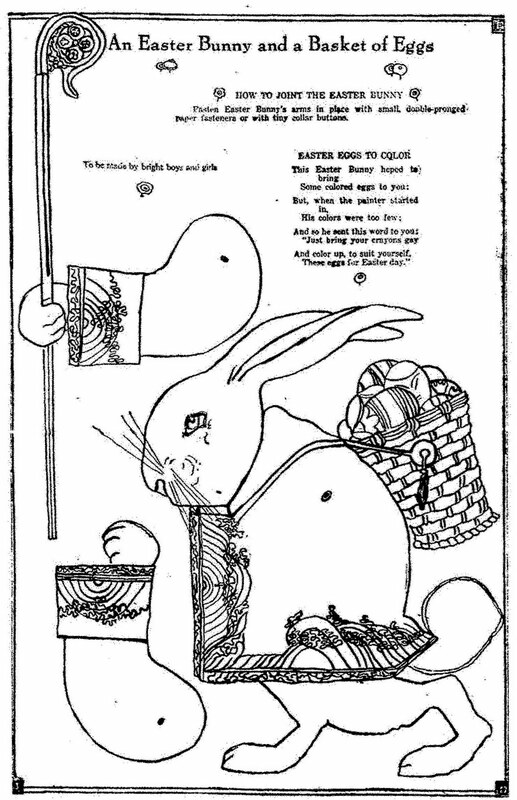 "EASTER EGGS TO COLOR - This Easter bunny hoped to bring/ some colored eggs to you;/ But, when the painter started in,/ His colors were too few;/ And so he sent this word to you:/ Just bring your crayons gay/ And color up, to suit yourself/ These eggs for Easter day." 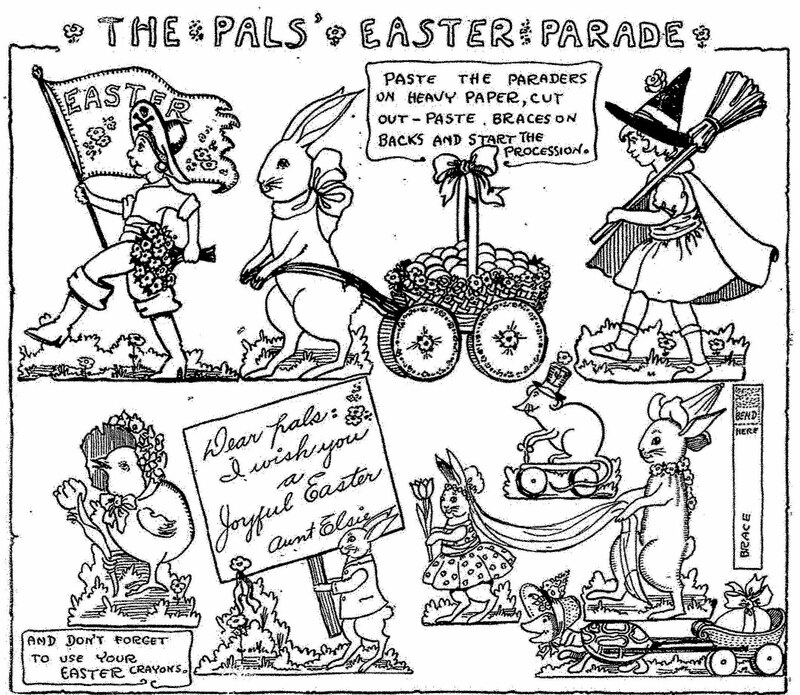 This Easter cut-out is from April 20, 1924. This is the only Dolly Josephine paper doll I have been able to find. 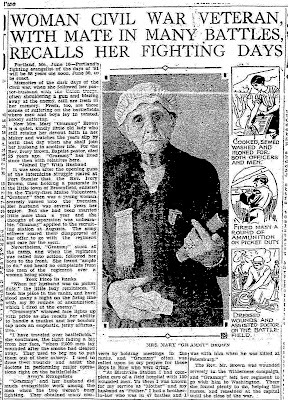 Dolly Josephine as a Globe Trotter is from June 11, 1922. 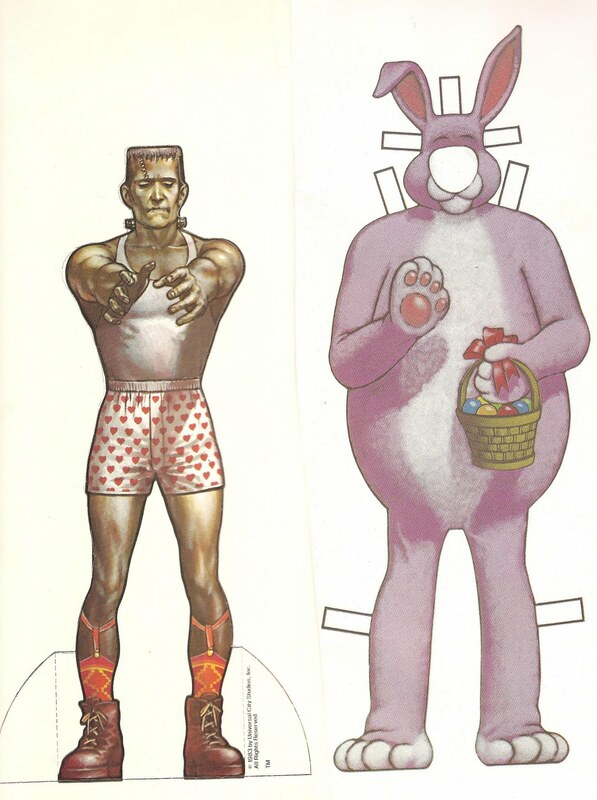 From "Monster Paper Dolls", designed by Jill Bauman and illustrated by Walter Velez. Published by Congdon & Weed, Inc., 1983. Thanks mom. 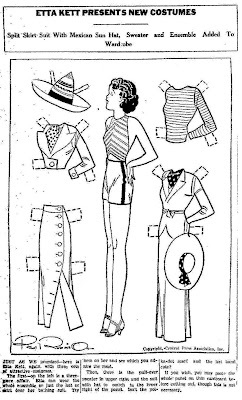 Etta Kett paper doll from Spring of 1936. 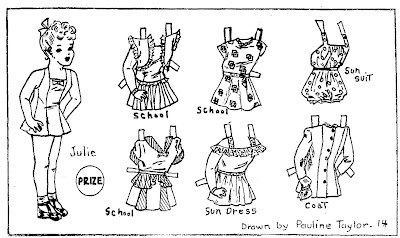 This paper doll by Pauline Taylor, age 14, appeared in the Tribune on August 18, 1946. 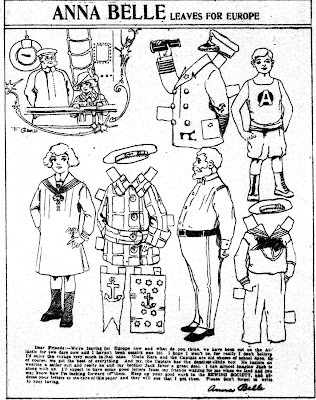 A Little Paper Prince from May 17, 1925. 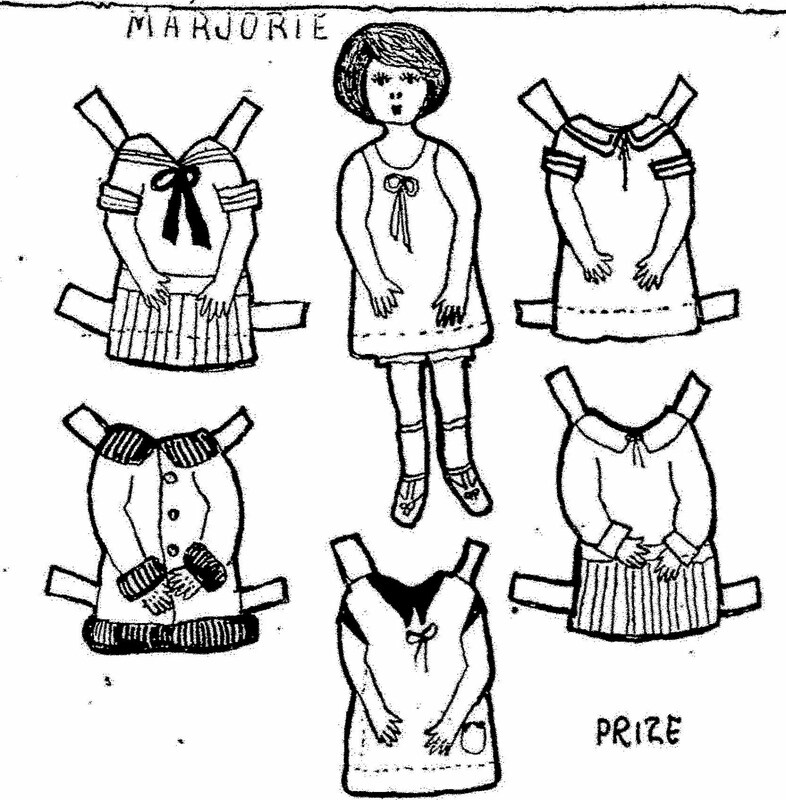 This paper doll, Marjorie, by Dorothy Webb, age 15, appeared in the Tribune on August 02, 1925. 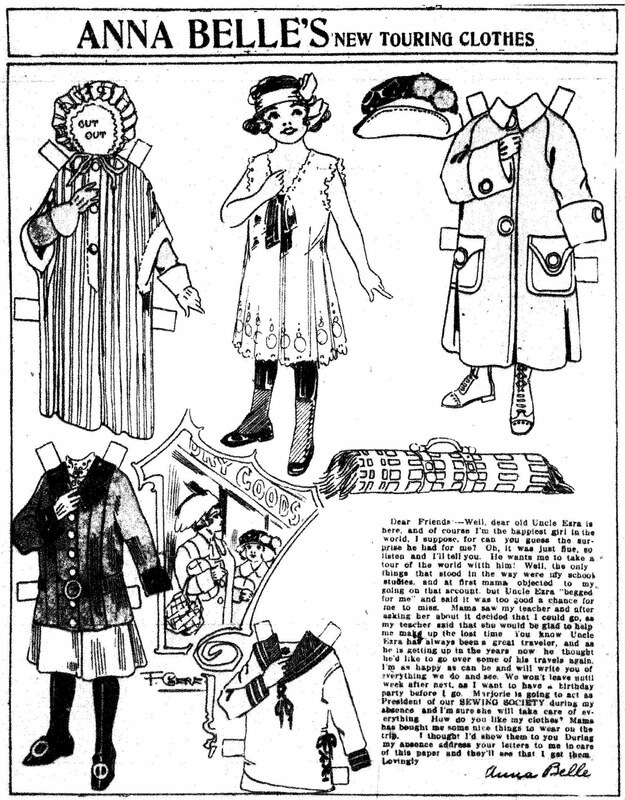 "Paste the paraders on heavy paper, cut out - paste braces on backs and start the procession. 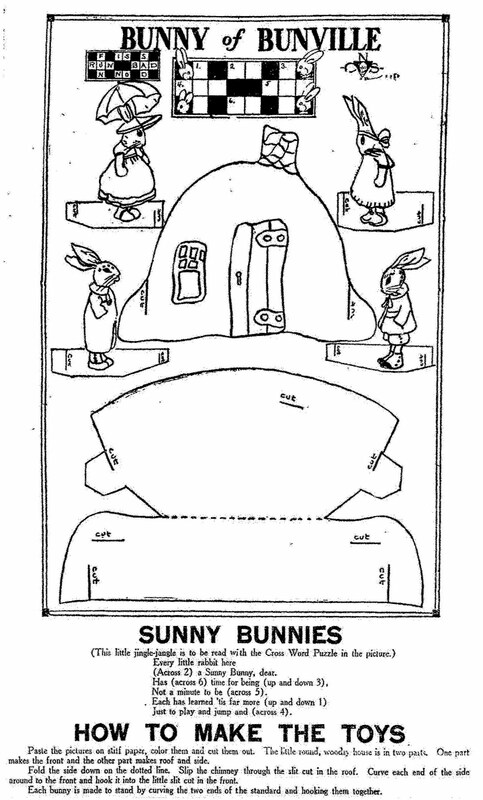 And don't forget to use your Easter crayons." 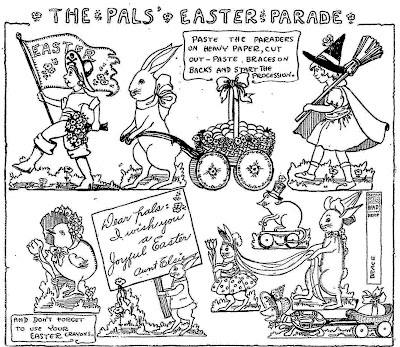 The Pals EASTER Parade from Aunt Elsie appeared in the Tribune on April 12, 1925. 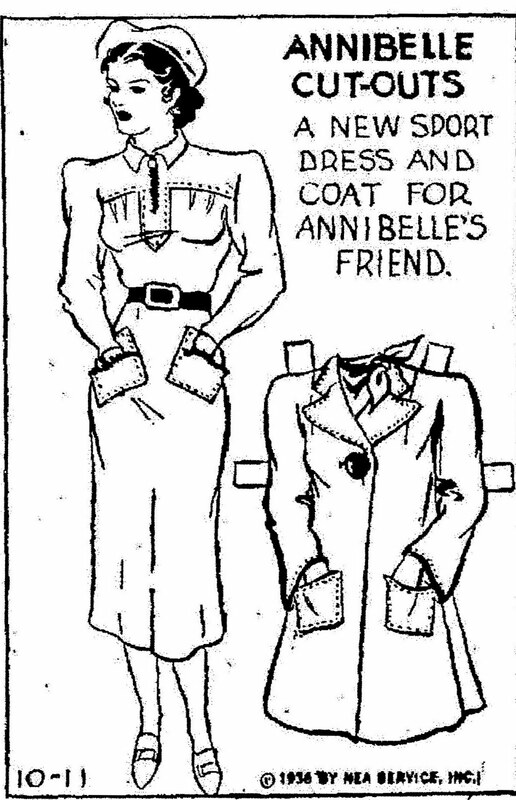 ANNA BELLE'S New Touring Clothes appeared in newspapers on March 02, 1913. 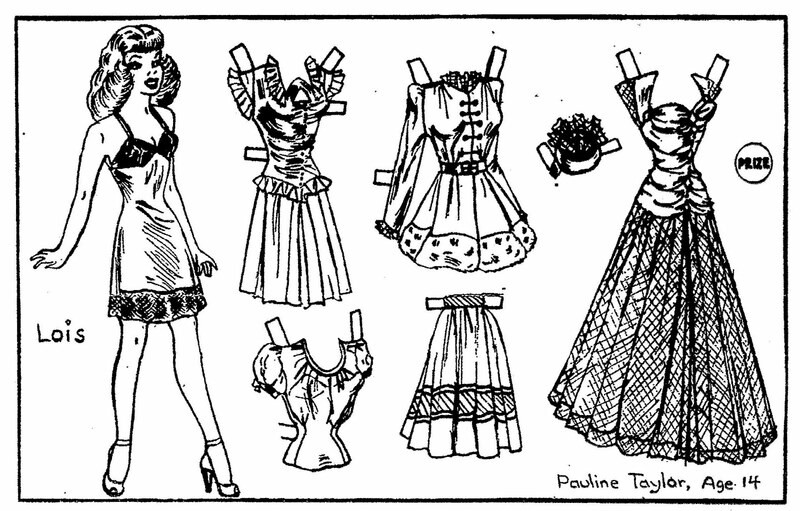 LOIS, a pretty paper doll by Pauline Taylor, age 14, appeared in the Tribune on May 26, 1946. 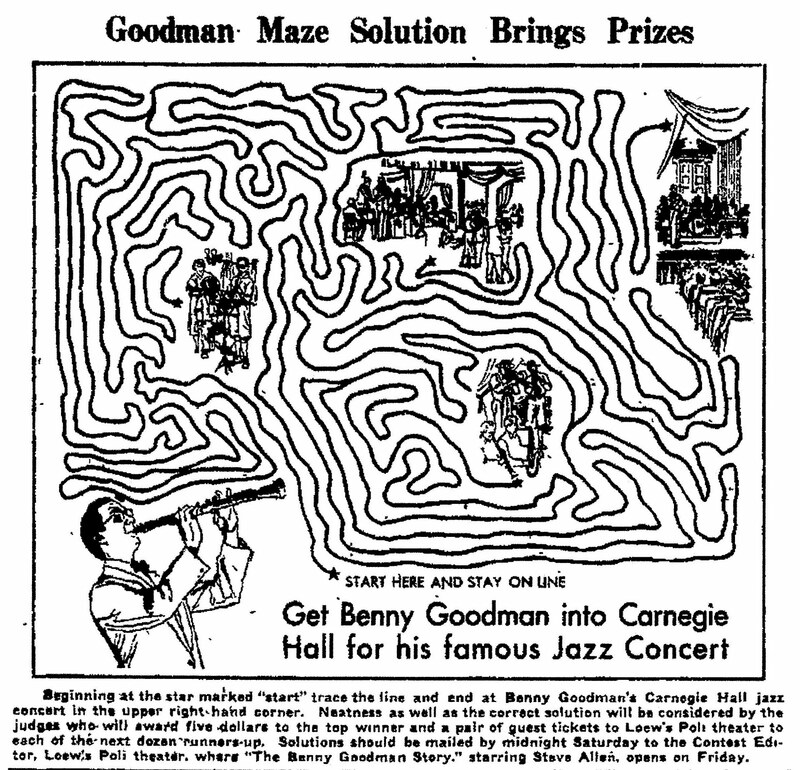 This maze contest appeared in newspapers in 1956. 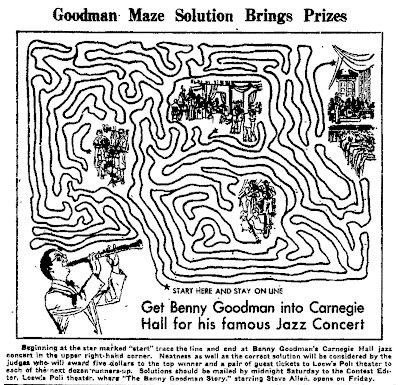 THE BENNY GOODMAN STORY starred Steve Allen, Donna Reed, Herbert Anderson, Hy Averback, Berta Gersten, Robert F. Simon, Sammy Davis, Gene Krupa, Lionel Hampton and Teddy Wilson. Additional guest performers include Harry James, Ziggy Elman and Martha Tilton. Benny Goodman himself dubbed Steve Allen's clarinet playing. 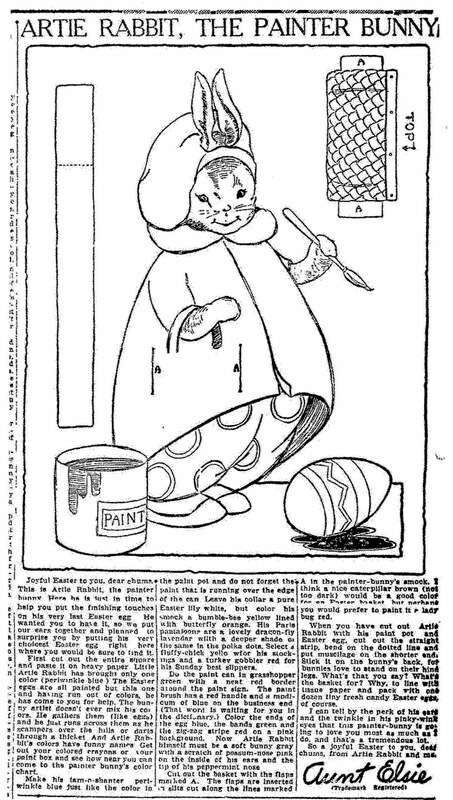 Artie Rabbit, The Painter Bunny from Aunt Elsie appeared in the Tribune on April 19, 1924. 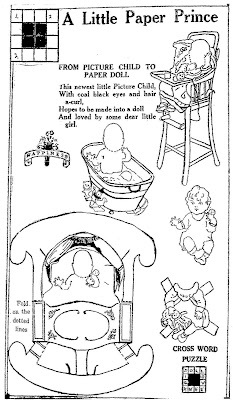 Aunt Elsie gives detailed instructions on how to color Artie and put him together. BETTY LOU and Her Easter Wardrobe paper doll by Evelyn Cooley, age 13, an Aunt Elsie Paper Doll Club member, appeared in the Tribune on March 27, 1932. The outfits are well drawn. Evelyn did a very good job. 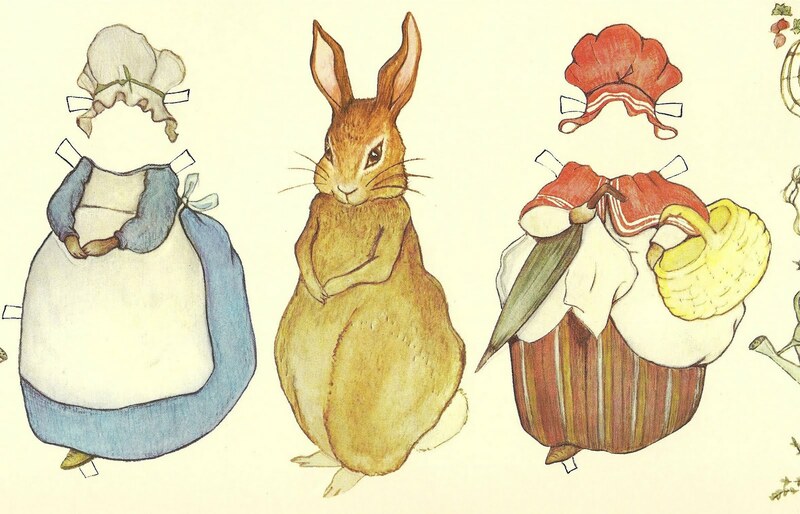 I am a Beatrix Potter fan and I really like Peter and the rest of the rabbit gang. Thanks mom. "Cut out around the outline. 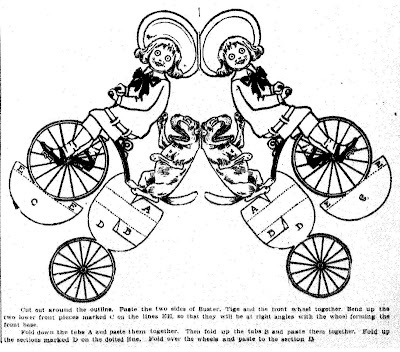 Paste the two sides of Buster, Tige and the front wheel together. Bend up the two lower front pieces marked C on the lines EE, so that they will be at right angles with the wheel forming the front base. Fold down the tabs A and paste them together. Then fold up the tabs B and fold them together. 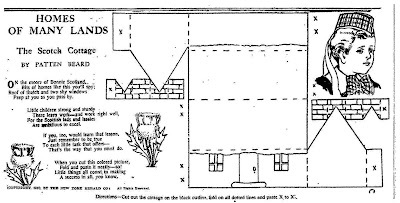 Fold up the sections marked D on the dotted line. 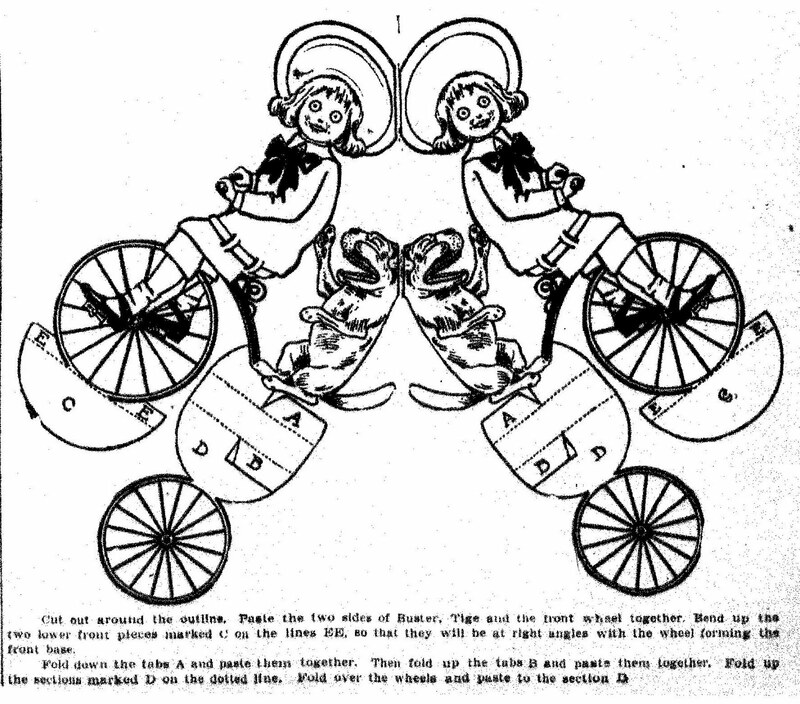 Fold over the wheels and paste to the section D." - This cut-out from March 19, 1905, is from a series of Buster Brown cut-outs that appeared in newspapers in 1905. 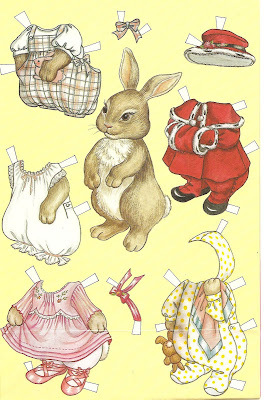 Today I found about a dozen more paper dolls from the ANNA BELLE series. 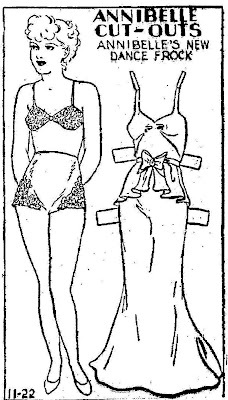 These two paper dolls and a few others from 1913 I found in an Indiana newspaper, and I found three paper dolls from 1916 in the Ogden Standard - Hooray! 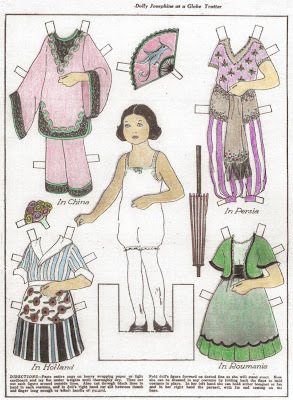 Unfortunately, the Russian Count is the only paper doll I could find from the European Vacation. 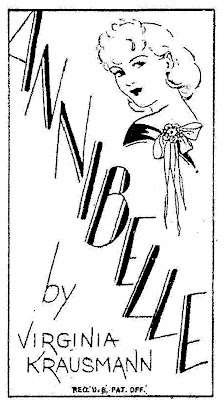 "ANNA BELLE Leaves For Europe" is from March 23, 1913 and "ANNA BELLE Meets A Russian Count" is from March 30, 1913. 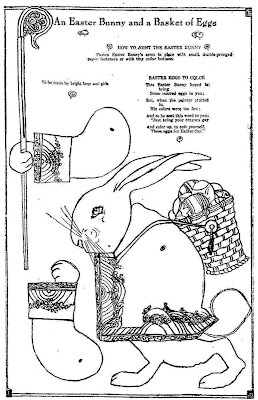 "Calling all kids for the DUNKIN' DONUTS Bunny Coloring Contest." This contest appeared in newspapers in March of 1971. I like it! 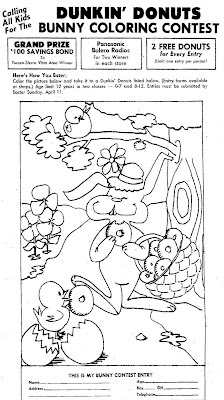 Another Susie May coloring page, this one for Easter. 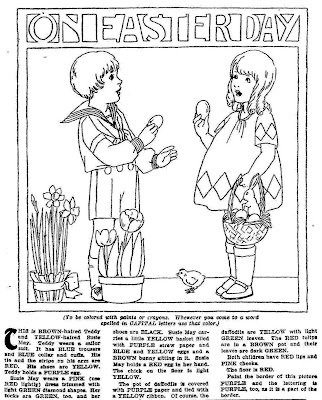 ON EASTER DAY appeared in newspapers on April 13, 1927. 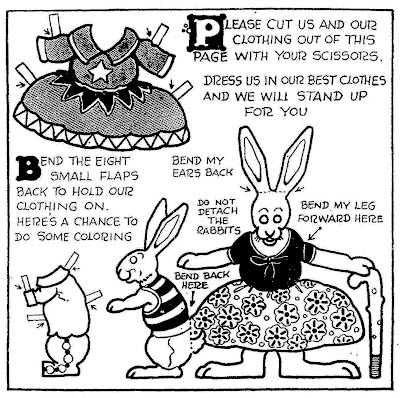 "Please cut us and our clothing out of this page with your scissors. 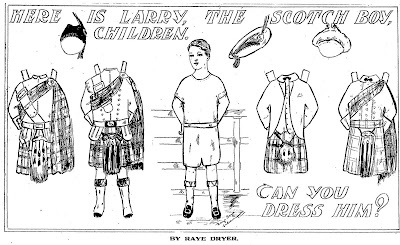 Dress us in our best clothes and we will stand up for you." 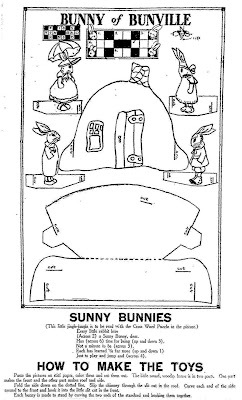 - These cute rabbits by A. W. Nugent appeared in newspapers on August 07, 1932. 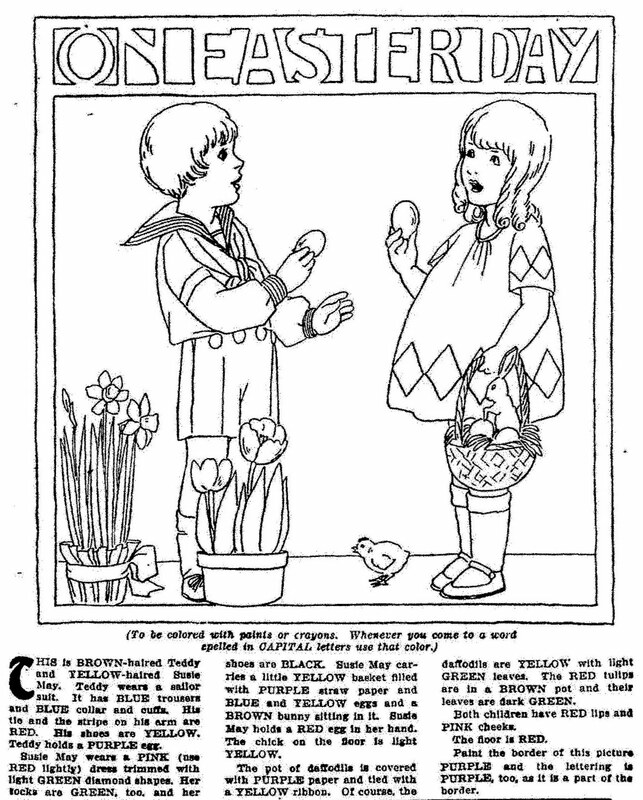 These Happy Easter banners appeared in the Children's Section of various newspapers in April of 1980. Color, paste on cardboard and then cut out. 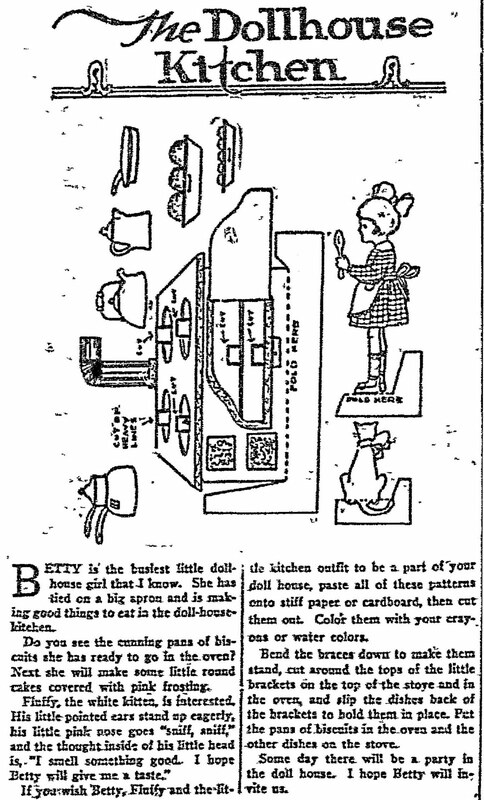 "Betty is the busiest little dollhouse girl that I know. She has tied on a big apron and is making good things to eat in the dollhouse kitchen. Do you see the cunning pans of biscuits she has ready to go in the oven? Next she will make some little round cakes covered with pink frosting. Fluffy, the white kitten, is interested. His little pointed ears stand up eagerly, his little pink nose goes "sniff, sniff," and the thought inside of his little head is, "I smell something good. I hope Betty will give me a taste." 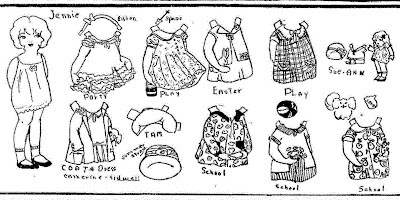 If you wish Betty, Fluffy and the little kitchen outfit to be a part of your dollhouse, paste all of these patterns onto stiff paper or cardboard, then cut them out. 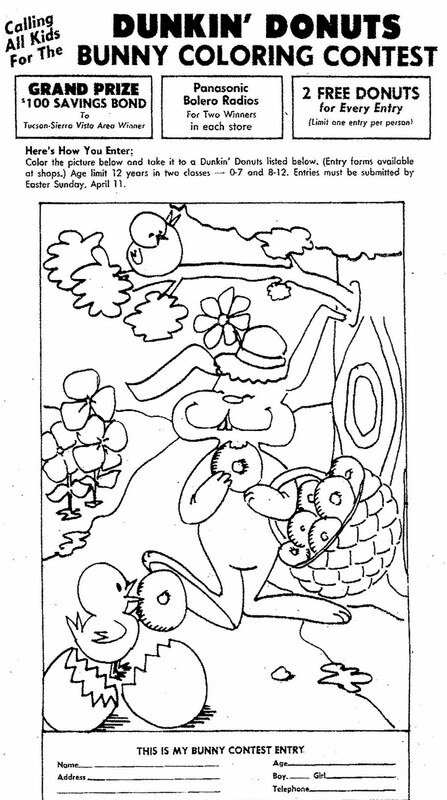 Color them with your crayons or water colors." 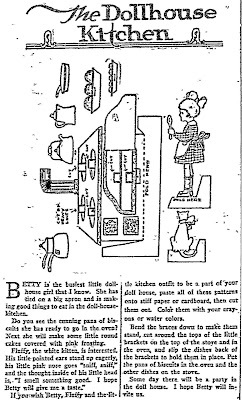 - The Dollhouse Kitchen appeared in the Dallas Morning News on May 20, 1917.